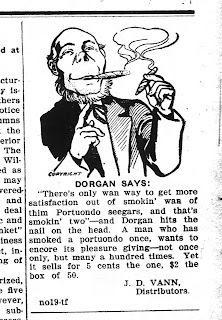 April 24 1909 -- Herriman's back in harness after a month-long layoff from major cartlooning duties at the Examiner. I'm assuming this has something to so with the strip Mary's Home From College, which he produced for Hearst's New York papers at this time. 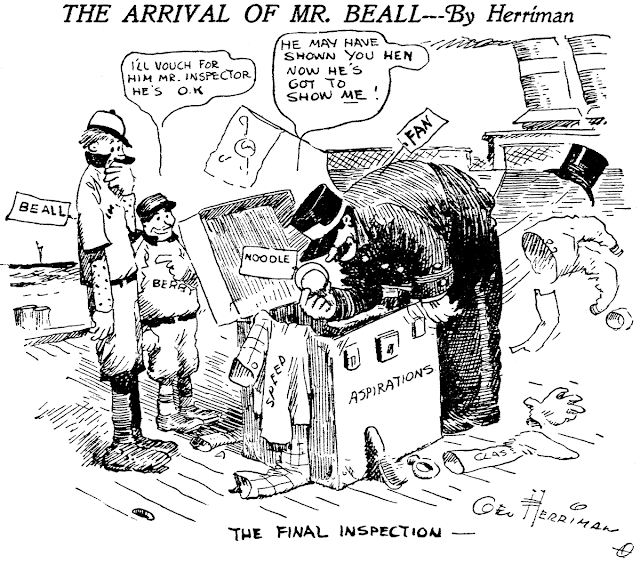 This cartoon refers to newcomer Johnny Beall, brought to the Los Angeles Angels by Hen Berry. Beall was awfully old to be a rookie at age 27, which is probably why the fans thought maybe Berry had lost his marbles. Turns out that Beall was a perfectly decent player, turning in a good performance in his single year with the Angels. Later on Beall would spend some time up in the bigs, but never made much of an impression at that level, and he appeared in just 58 games over a span of five years. His one claim to fame is that he was the first player to hit a home run at Wrigley Field, one of only three he hit in his major league career. Sadly Beall died young at age 44, less than a decade after he retired from baseball. Rowland Mount Smith was born in Mansfield, Ohio, on March 8 or 28, 1874. The Ohio, Births and Christenings Index, at Ancestry.com, said the birth day was the 8th and his parents were Elliot Smith and Ella C. Chandler. Smith’s World War I draft card said the 28th and had his full name. The 1900 U.S. Federal Census had Smith’s birth as March 1873. In the 1880 census, Smith, his parents and younger brother resided at 12 Water Street in Mansfield. His father was a machine painter. The Ohio, County Marriages, at Ancestry.com, said Smith married Ella A. Jones on November 11, 1896 in Crawford, Ohio. The Cleveland Plain Dealer, November 15, 1896, reported the wedding. The leading social event of the week was the wedding on Wednesday evening of Mr. Rowland M. Smith of Toledo to Miss Ella A. Jones of this city, the charming daughter of one of our wealthiest citizens. The home was resplendent with decorations of palms, smilax and chrysanthemums. About thirty relatives and intimate friends witnessed the ceremony, which was performed by Rev. 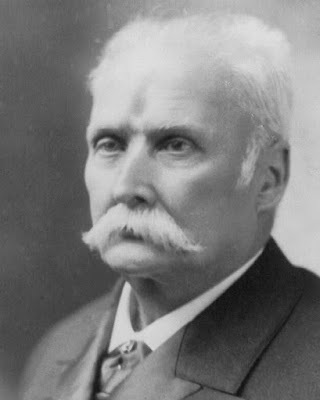 Homer C. Lyman of the Baptist church. The birds attended by her maid, Miss Laura Bacon, of Prairie Depot, was attired in white satin, while the groom and his attendant, Mr. Charles Smith, wore the customary evening suits. The newly wedded pair left on a bridal trip to points in southern Ohio. After their return they will reside in Toledo, where Mr. Smith is a talented artist on the staff of the Toledo Blade. The guests from abroad were Mrs. A.H. Widney of Weldon, Ill,; Miss Bacon of Prairie Depot and Miss Day of Mansfield. The 1900 Bucyrus, Galion and Crestline Cities and Crawford County, Directory had this listing: “Smith Rowland M, (Ella A) newspaper artist, h 405 e Charles”. According to the 1900 census, newspaper artist Smith and his wife were Chicago residents at 2507 Indiana Avenue. Artists in Ohio said Smith was an artist with the Chicago Tribune. Smith’s daughter Jeanette was born September 11, 1903 in Chicago, as recorded in the Cook County, Illinois, Birth Certificates Index. The Official Gazette of the United States Patent Office, November 14, 1905, said Smith was granted a patent for his scalp-massage brush. 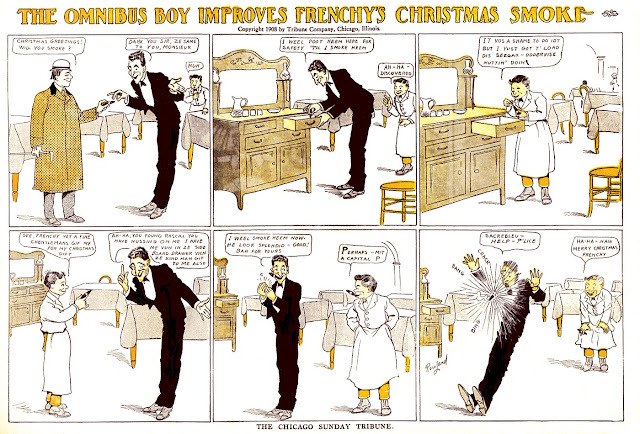 American Newspaper Comics (2012) said Smith drew The Omnibus Boy, from November 8, 1908 to February 28, 1909, for the Tribune. The 1910 census said Smith’s Chicago address was 6356 Greenwood Avenue which remained the same to the 1940 census. He continued working as a newspaper artist. In 1914, Smith’s work appeared nationally. He illustrated the Cream of Wheat advertisements that appeared in the April 1914 issues of Ladies’ Home Journal and McClure’s Magazine. 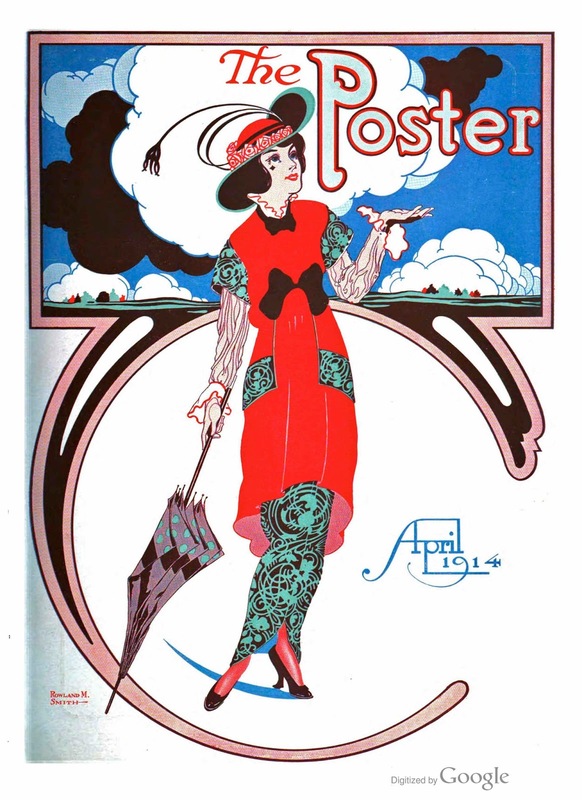 Smith was the cover artist of The Poster, also in April 1914. The cover of The Poster this month was designed by Rowland M. Smith of Chicago. Mr. Smith was with the National Printing & Engraving Company for a number of years and also with several of the leading newspapers of the West. 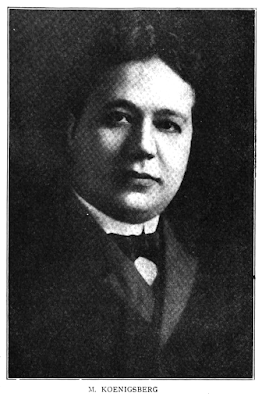 For four years he was assistant manager of the Art Department of the Chicago Tribune, and for nearly two years was manager of the Art Department of the Chicago American, leaving the latter employment to engage in the advertising and poster field. 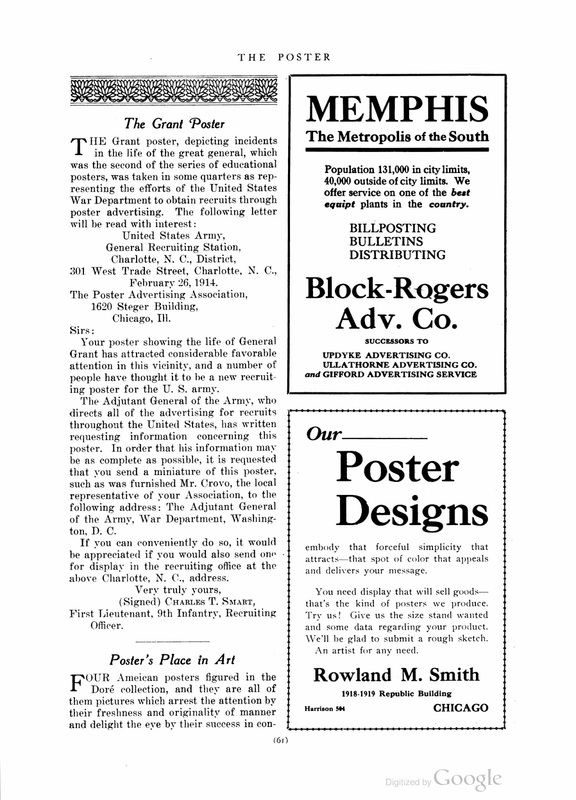 The Pensacola Journal (Florida), April 30, 1914, mentioned Smith’s cover for the Editor and Publisher of April 25. Smith advertised in the May issue of The Poster. A 1914 Chicago city directory listed Smith’s office at 209 South State Street. Smith signed his World War I draft card on September 12, 1918. He was described as medium build and height with blue eyes and gray hair. The self-employed artist was producing advertising design at 76 Monroe Street, Chicago. Smith was doing the same work according to the 1920 census. He has not been found in the 1930 census. Apparently Smith and his wife were retired in the 1940 census. The household included Smith’s daughter, who was married to “Marshall Cleman”, and granddaughter, Carol. Smith’s son-in-law was a photographer. What became of Smith is unclear. 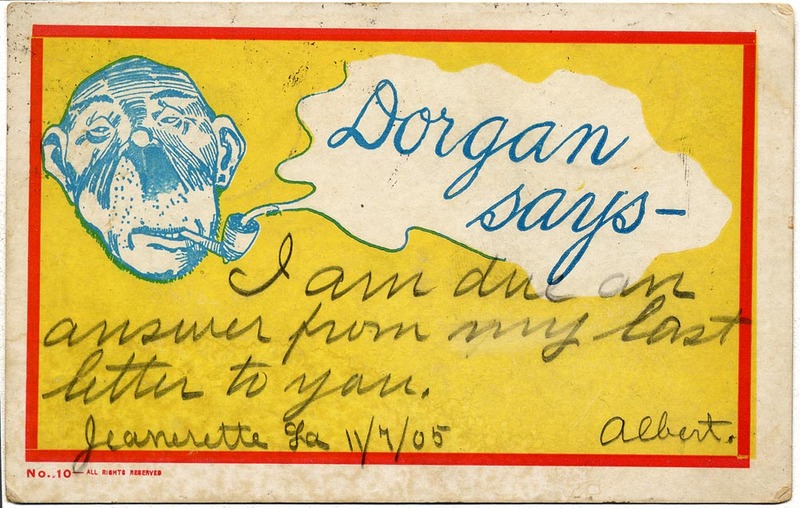 He has not been found in the Social Security Death Index or an obituary. However, Find a Grave has a Rowland M. Smith who was born in 1874 and passed away in 1955 and was laid to rest in Forest Hill Cemetery. Looks like he died in 1955 in illinois. The superstar illustrator/cartoonists of the early part of the century, like James Montgomery Flagg and Charles Dana Gibson, rarely stooped so low as to put pen to paper for a mere newspaper. They were paid princely sums by the magazines, and no newspaper had the wherewithal to entice them to go slumming. Oh, I suppose Mr. Hearst could have opened his pocketbook that wide, but he rarely did, preferring in general to poach talent from other newspapers, not the top-shelf magazines. Nevertheless, Messrs. Flagg and Gibson did have their work occasionally make an appearance in newspapers, but its presence there was generally either a ploy to sell a book, or to squeeze some extra profit from some pre-existing project. City People is an example of the latter. 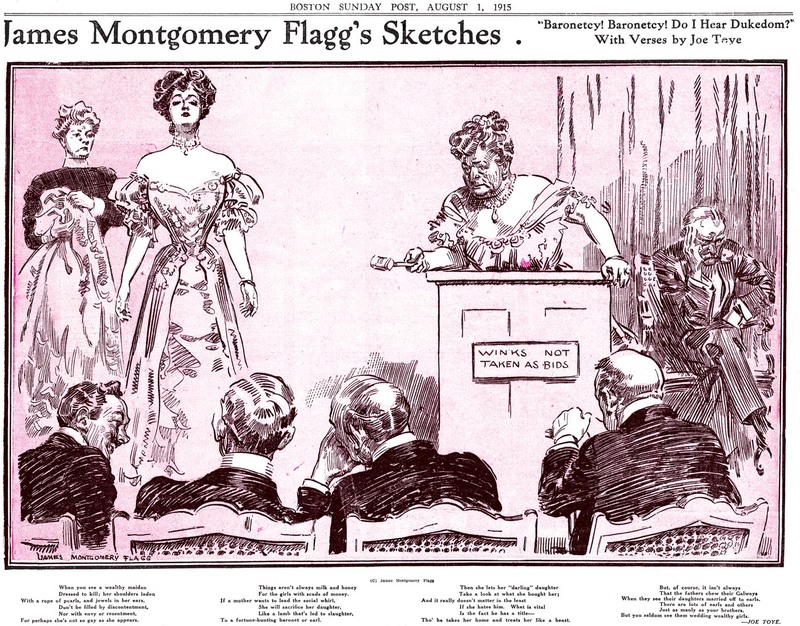 There was a book published in 1909 by Scribners titled City People, an extravagant large-format book of James Montgomery Flagg's magnificent cartoons. My impression is that it didn't sell all that well, and perhaps that's why Scribners felt the need to make some extra money from the project. They offered newspapers a selection of the cartoons from the book, and sweetened the pot a little by contracting Joe Toye to write some poems to go along with them. 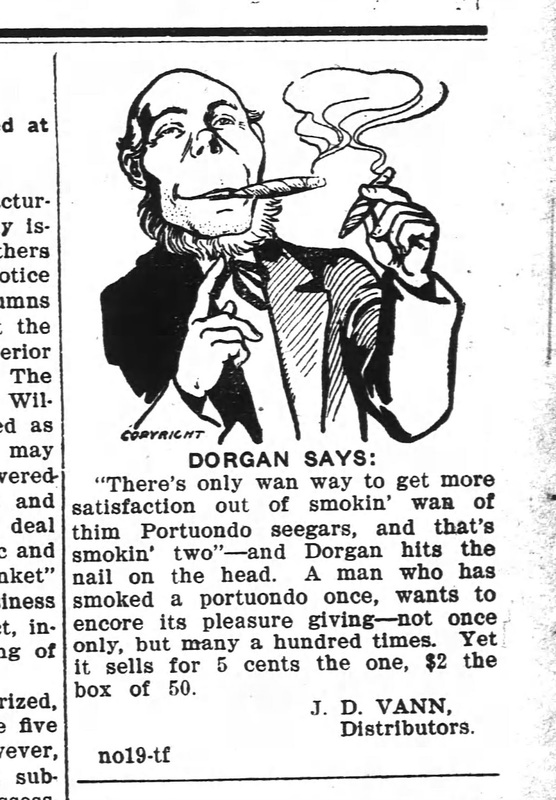 The newspaper series was not a big seller for some reason -- perhaps Scribners asked too much for the rights. 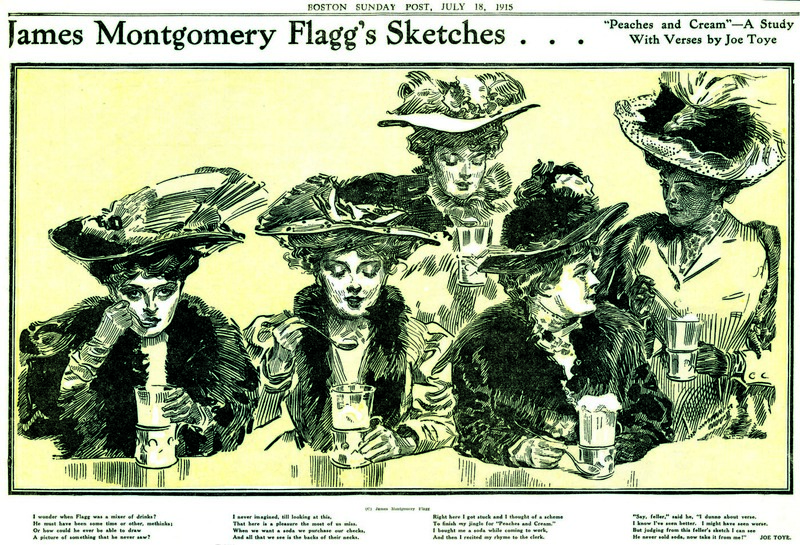 Many papers that did take the series didn't run it under the title City People (as the Boston Post didn't, above) but used the title James Montgomery Flagg's Sketches, which was actually the title of a different series that ran in 1913-14. Many papers also dropped Mr. Toye's verses, which would normally suit me just fine as I can't stand the typical doggerel, but Toye's work was actually delightfully jaunty, well-metered, in short well worth the space. City People ran from June 6 to September 12 1915.